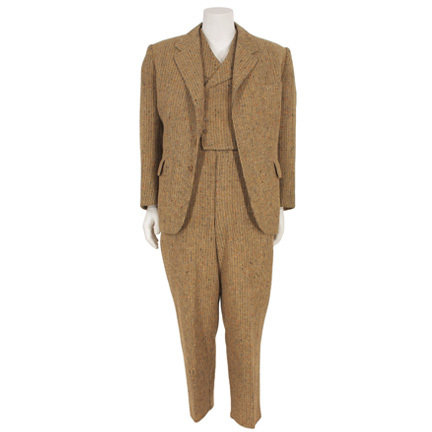 This three piece suit was worn by the character “Willie ‘Tubby’ Piper” portrayed by legendary comedian Lou Costello in the 1955 Universal Pictures production “Abbott and Costello Meet the Keystone Cops”, also starring long time partner Bud Abbott. 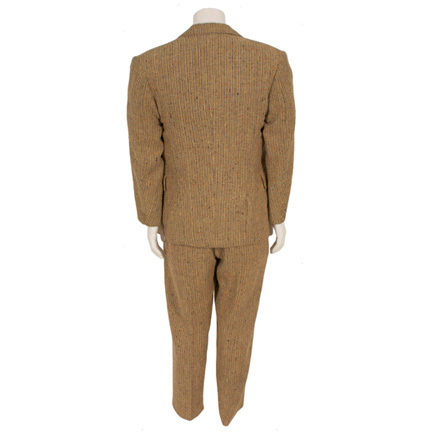 The suit is constructed of tan flecked wool and consists of a jacket, pants, and matching double-breasted vest. 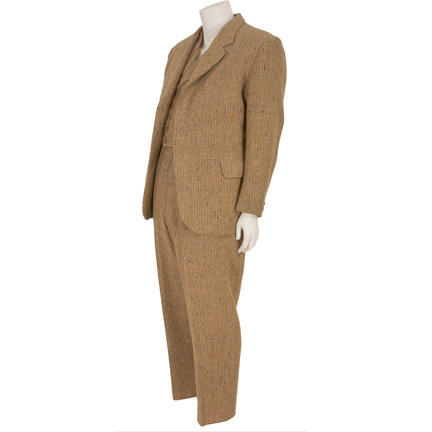 Mr. Costello appeared wearing this outfit in several scenes during the sequence where Piper and his friend “Harry ‘Slim’ Pierce” (Abbott) sneak into a studio viewing room and hide in the back behind the studio head and director who are watching dailies of Piper wearing a flight suit as he does stand in work as a stunt double. 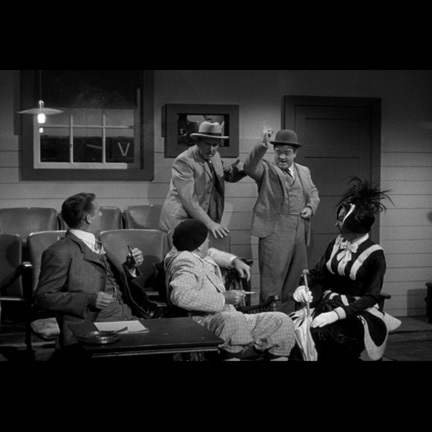 Both the director and studio head find themselves laughing at Piper’s antics before the two uninvited guests are noticed and promptly tossed out of the room. 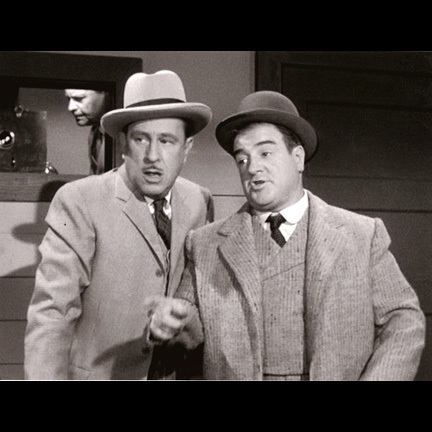 Realizing the duo’s entertainment value to the studio as a natural comedy team, the studio head yells at the director to catch them. On their way from fleeing the studio Pierce and Piper lose something down a manhole and lie down on the ground to try and regain it, which leads the director to think they’ve been run over dead in the street. 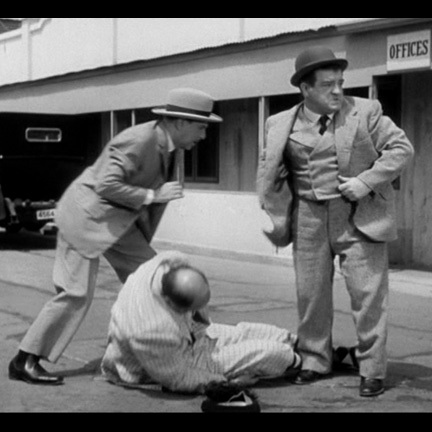 As the man leans down to inspect the “bodies”, Piper suddenly pops his head up and startles the director into fainting before the two run away. 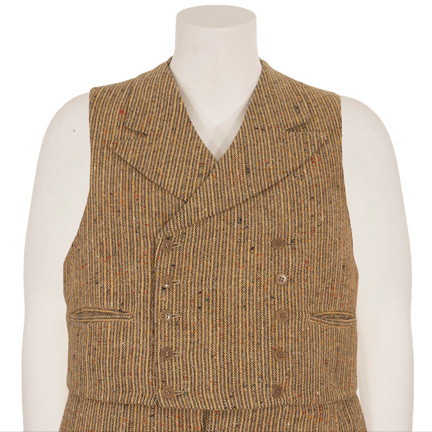 The suit was slightly modified for use in a later unidentified production and had buttons added to the jacket to make it appear double breasted, “reversed” buttons on the vest to make it “female”, and the pants were taken in slightly. All three garments have since been professionally restored to their original state by Gilberto Guzman, Master Tailor of Eastern Costume Company. 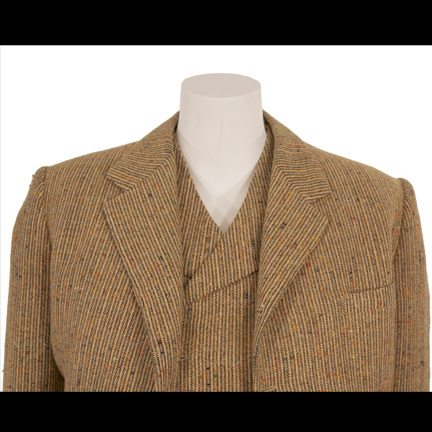 None of the alterations have changed the original structure of the garments in any way and they have been returned to their exact screen used appearance. 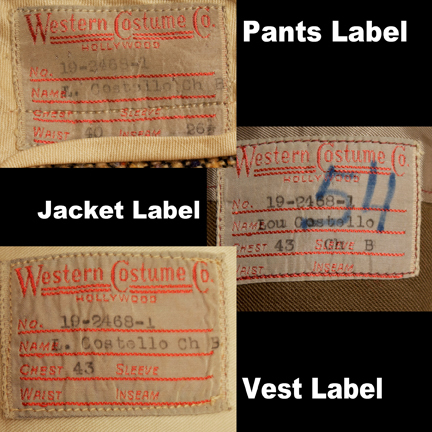 The suit is in very good screen worn condition and all three garments are complete with the original Western Costume Company labels sewn inside with the name “L. Costello, Ch. B”, sizing information, and inventory production # 19-2468-1” clearly typed in black ink. Accompanied by a letter of authenticity.